Originally posted: April 29, 2017 . Last modified: April 6, 2019 . 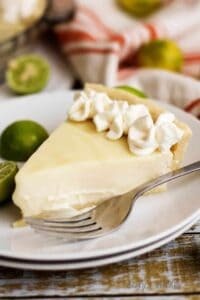 A homemade silky smooth key lime pie that’s creamy, sweet, and tangy and is prepared with authentic key lime juice. It’s the perfect pie for Spring! I am sure at this point you have probably begun to realize that key lime is one of our favorite dessert flavors. From dips to pie, this citrus fruit brings the perfect balance of tart and tangy to any sweet treat. For today’s recipe, we present our Silky Smooth Key Lime Pie. It was inspired by another blogger, Jolina, at The Unlikely Baker. However, she wasn’t the only one who helped us bring this delicious dessert to you. Nicole, from Gluten-Free on a Shoestring and The Hero Rolling Pin kit we received also contributed to making this key lime dream come true. Jolina is a food blogger and all-around wonderful person. Every interaction I have had with her so far has always been a joy. Don’t let the name of her blog fool you; this lovely lady can bake, saute, and whip up a meal that is sure to satisfy any craving. She has many recipes to choose from, both savory and sweet. One weekend we decided to try her Dreamy Creamy Meyer Lemon Pie recipe, and we were hooked! It has a smooth, silky texture and is sweet and tart at the same time. One bite and Kim and I had to share this fantastic recipe. The only changes we made were to substitute key limes for Meyer lemons and increase the amount of sweetened condensed milk. All the credit for this fabulous pie filling goes to Jolina! Her website is definitely a “must see” blog! It’s buttery, flaky, and so good I have to eat the back of the pie crust first before digging in with my fork. Yeah, it’s that good! In fact, I will be using it for all my pie crusts from now on, so Kim doesn’t get left out. The only thing Kim ran into was the crust is so flaky that it can break when you try to move it from the countertop to the pan. Honestly, anything can cause that, from humidity to technique. So, I don’t think that’s any reflection on the recipe. Additionally, I encourage you to check out Nicole’s site for more awesome gluten-free recipes! The last conspirator in this menagerie of key lime goodness were the Hero Rolling Pin kit and pie weight sets. The rolling pin is unique in two ways. First and foremost, it can be filled with cold liquid. This is a cool feature when you are working with crusts and doughs because the butter has to stay cold. Secondly, it has measurements and guide strips that help you obtain the correct diameter and depth of dough. It was great not to have to “eyeball” everything. When we received our kit, I used them on our biscuit recipe, and it was unbelievable to see the rolling pin in action. The biscuits turned out flaky and golden! 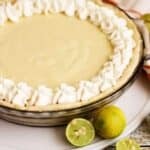 Kim used the rolling pin and the pie weights with this key lime pie recipe and once again, everything was perfect. In closing, I would like to thank everybody involved in making this key lime dessert possible! As always, I wish you all a long healthy life, everlasting love, and a tummy full of delectable treats! 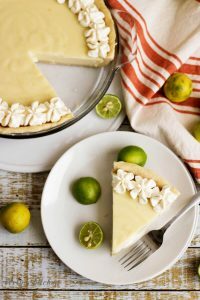 A homemade silky smooth key lime pie that's creamy, sweet, and tangy and is prepared with authentic key lime juice. It's the perfect for pie Spring! 6 Tablespoons Unsalted Butter, roughly chopped and chilled. Mix the flour blend, xanthan gum, baking powder, and salt in a medium bowl until well combined. Cut the butter in with a pastry cutter or flatten it between your fingers as you mix it with the flour. Ensure that the butter is evenly coated and mixed. Add the sour cream and combine until the mixture begins to form a dough ball. Add ice water a teaspoon at a time if necessary just to bring the dough together. Remove the dough from the bowl, form into a ball, and wrap with plastic wrap. Place in the refrigerator for at least 30 minutes before rolling. Remove the dough from the fridge and place on a lightly floured surface. Carefully begin to roll the dough with light pressure. Crimp or style the edges as desired. Poke holes in the bottom of the crust with a fork. Place parchment paper onto the crust and lay pie weights on the parchment paper. Place crust in the preheated oven (375 degrees for the crust) and bake for 30 minutes. Remove from the oven and allow to cool completely before filling. Combine all ingredients in a medium bowl and pour into a cooled pie crust. Bake at 350 for 10-15 minutes or until small bubbles form around the edge. Remove from the oven and allow the pie to cool for about an hour before transferring it to the refrigerator to cool completely (2-3 hours). Garnish with whipped cream of your choice. The calories listed on this recipe card include the gluten-free crust and key lime pie filling. The whipped cream topping is optional and is NOT included on the recipe card or the calories listed below. 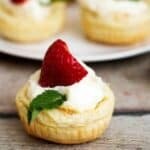 You may use any kind of crust you desire and if you would like to use our homemade whipped cream, you can get the recipe here. Yum! Key lime pie! Love it. The problem is key limes don’t make their way up to my part of the world too often. Hi, Cheryl! Aw, that’s too bad that you can’t find key limes. Have you tried to find key lime juice? Amazon has it, and it works well. 🙂 Thanks for stopping by! Aw you guys are the best 🙂 I’m so happy you liked my lemon pie! And you know I’m Team Lemon but hey, I like key limes too and this pie looks fantastic! Perfectly creamy and luxuriously smooth. Key limes are hard to get around here (maybe they avoid the cold, I don’t blame them haha) but we get the juice so yay. Great spring and summer treat! Thank you for making that delicious pie! Lemons are great, but key limes are everywhere here lol! I am glad you can get the juice because they are so versatile. They can be used in pies, frostings, whipped creams, salad dressings, you get the idea lol! Thank you again for commenting and I am glad you liked the pie. Have a great week, Jolina! Oh gosh this looks tempting! I like creamy desserts. ? Thank you, Janice! Me too, it’s so sweet and tangy 🙂 I am thrilled you like it! 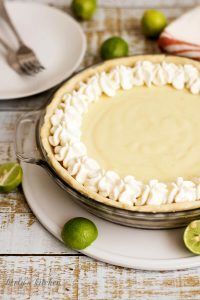 Key lime pie is my absolute favorite and now I’m seriously craving it after your gorgeous photos. Cannot wait to try out this recipe! I have never tried key lime pie, But this looks so good. Thanks for the recipe! Thank you, Brittany! I hope you give it a try some time. It’s tangy and sweet! What a beautiful dessert! I love key lime pie. It’s so refreshing! You have me at Key Lime. Oh my word, I love key lime pie! This recipe looks fabulous! I love key lime pie! What a great summer recipe! I’ve never had a key lime pie but they always get my attention in photos, they always look si beautiful! I’ve just never seen one on a menu and haven’t attempted to make one myself. This is making me reconsider… ? Thank you, Niki! Well, I might be biased here, but I definitely think you should give the key lime pie a shot 🙂 It’s tangy, sweet, and unlike any other lemon or lime pie you have ever tasted. It’s worth the effort or the price lol! Oh yum! This looks so delicious. I love how light Key Lime Pie is compared to some other desserts! I love key lime pie! It reminds me of vacation and amazing days spent on the beach, and I am so excited to bake some this summer! Thank you for this yummy recipe! This looks so good! Key Lime is my very very favorite! Key lime pie is one of my favorite summer treats. Yum! YUM! Looks so fantastic!! I love a good key lime pie! One of my favorite all time pies. I love the tart flavors with the creaminess. Thanks for sharing! Yum! This is a great summer dessert! Thank you, Kimberly! I am glad you want to try the pie 🙂 I hope everything turns out perfectly for you! This looks delicious! 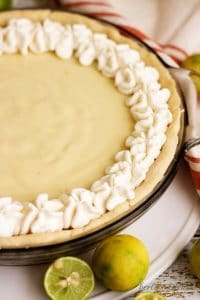 My husband loves key lime pie, but I’ve never made one! Your filling looks so easy – only 4 ingredients. I’ll be trying this one out this summer! Key lime pie is a favorite in our house. I absolutely love key lime pie. I’ve never tried making it myself, but with this recipe, I am keen to give it a try! Thank you, Meg! I am glad you like it and want to give it try 🙂 I am sure it will turn out lovely! 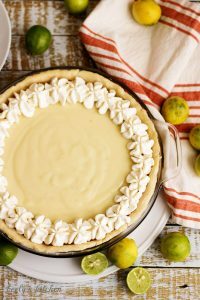 Key Lime has always been one of my favorite pies! I really need to make one this spring – recipe Pinned for later!! Your write up of this recipe had my mouth watering! My boyfriend’s mother is gluten free and I’m always at a loss at what to make for dessert when we have dinner with her. I’m so excited to make her this recipe – a gluten free FLAKY pie crust sounds amazing. Thank you!